Ken Guest brings an anthropological and analytical approach to familiar experiences and shows how the tools of cultural anthropology are relevant to a globalizing world. The book's popular "toolkit" approach is enhanced in this edition with new "The Social Life of Things" features, which examine everyday objects to see how they connect to global forces and affect local communities. "Your Turn: Fieldwork" exercises in the text and the companion Fieldwork Journal engage students in practicing anthropology while end-of-chapter discussions ask students to apply what they've learned. Cultural Anthopology includes cutting-edge, chapters on "Race and Racism," "Ethnicity and Nationalism," "Sexuality," "Migration," and "Class and Inequality," and puts every chapter in the context of global change. 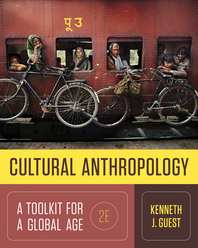 With an emphasis on globalization throughout the text, Guest includes compelling research conducted by contemporary cultural anthropologists to illustrate the importance of fieldwork in all areas of anthropology. "Anthropologists Engage the World" features—several of which are new to this edition—show how practicing anthropologists apply anthropological thinking and methods to pressing social and political issues. To "think like an anthropologist" students must first understand basic concepts and terminology. InQuizitive is a formative, adaptive learning tool with gamelike elements that motivates students as they learn and helps prepare them for lecture and exams. Additionally, Cultural Anthropology's coursepack offers a variety of assessment and review materials, as well as chapter-based assignments, streaming documentary film clips, test banks, quizzes, and an optional ebook. Cultural Anthropology offers affordable print options as well as a low-cost ebook that saves students even more money. Additional value can be added by packaging the Cultural Anthropology Fieldwork Journal for free, adopting InQuizitive for a low price, or using the coursepack for free.